This, for me, is sort of like a Christmas tree. The sneakers are mostly tacky ornaments, but the overall, collective effect is quite festive. So you’re probably thinking since I compared the first one to a Christmas tree, that this one must be the crèche. Which would make Mary and Joseph headless bike messengers, and the baby Jesus the World Cup soccer ball whose suspect design has all the losers whining in their foreign equivalent to Wheaties. But no. It’s just an ugly, chaotic window display. Also, headless Joseph is wearing basketball(?!) sneakers. 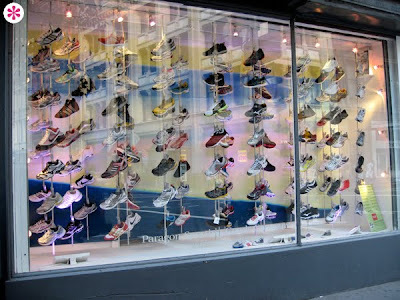 I love the first window - it's like a snowstorm of shoes in a rainbow. The second one gives me an instant headache - I'd never even go into a store with such a depressing window display. And what's with the vertical, horizontal, and diagonal bars across the window? Scary! 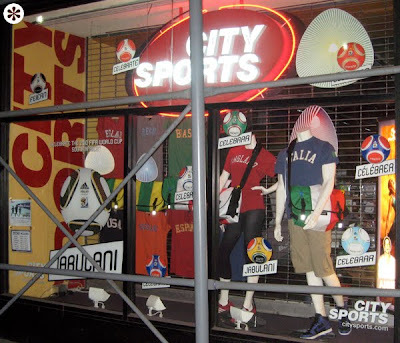 The gray bars in the foreground are part of a scaffolding setup over the sidewalk in front of the store. A common sight in NYC. Sorry the photo isn't better. The repetition of the brands and store name all over the place in the second display isn't helping; it's like throwing tinsel all over the aforementioned crèche.